My friend has recently found this. 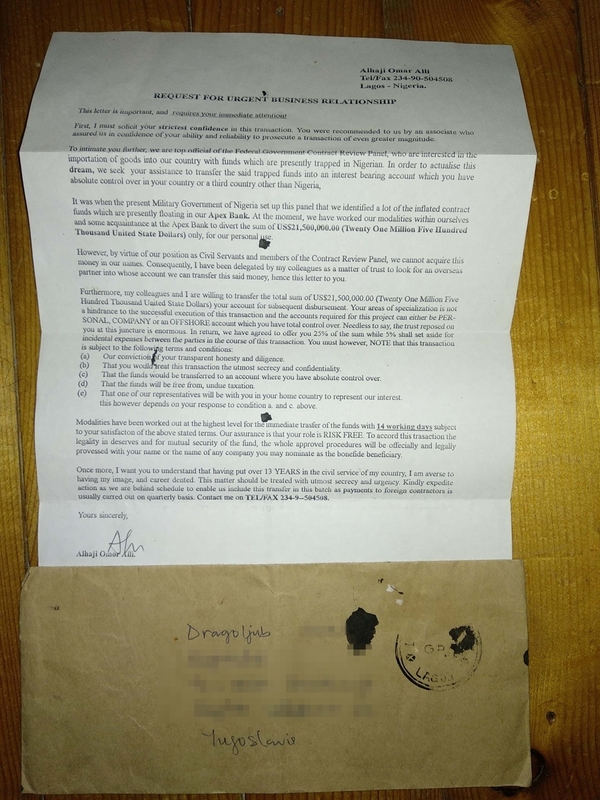 His grandfather got this letter in 1997 in the company where he worked at. No money was sent as nobody knew English at that time. Interesting what methods have they used 22 years ago. Edit: I have redacted address and other real life info. Seems strange to not see an email address! Glad no one fell for it. Interesting that the dollar value hasn't changed much in 21 years. $20 million used to be even more appealing then it is now. Sir, as an Englishman, I can assure you English has existed since the 1920's. Funny, I had a lad contact me this week to offer over $5B, but I suspect it was a typo in his email as he wrote "$5,000,000 thousands USD."